Choosing 100 movies out of the 400 that I saw was actually harder than I expected it to be. I saw a ton of great movies this year. These next few blogs will cover the ones that I saw. I am only covering the ones I saw, so that means some of my favorite movies will not appear these blogs. Movies like Almost Famous, A Hard Day's Night, and It's a Wonderful Life are not on this list because I did not watch them. Also, this list only covers the first 400 movies/television seasons that I watched. So, that means that movies like The Apartment, The Holiday Inn, and State of Play do not appear on this list because I watched them after I reached the 400 mark. All of those movies would have made the list, but I am just concentrating on the first 400. These lists are not in order at all. I am just going through them and telling you a little bit about the movies and why I liked them. So, there is no ranking at all to these. Just because Lincoln is at ninety-one does not mean that there are ninety films better. Scrooged is Christmas classic in my opinion. I love Bill Murray and he is great in this role. I think it is a great modern adaptation of A Christmas Carol, a novel by Charles Dickens. I love this story from Charles Dickens and I love most of the adaptations I've seen, but for some reason Scrooged might be favorite. It has some great comedic moments and it stars Bill Murray in the Scrooge role. If you are wanting something to watch this Christmas then this might be one of the movies you should watch. Yankee Doodle Dandy is a great old-timey musical. The film is anchored by a great performance from James Cagney, who won his only Oscar for the role of George M. Cohan. It was a different film for Cagney because he had been known as an actor who played most Gangster roles like he did in Angels With Dirty Faces and The Public Enemy. What most people did not know about Cagney was that he started his long career in vaudeville and on Broadway. He had training in musicals and Yankee Doodle Dandy was a great opportunity to show his skills. Today, the film is regarded as an American musical classic. The American Film Institute has listed it in both of their lists on the 100 Greatest Movies of All Time. The film also was named by the AFI as the 18th best Movie Musical of All Time. So, if you want to hear some great songs and learn about George Cohan, the man whose statue still stands in Times Square, then Yankee Doodle Dandy is a movie you need to watch. So, I love things about Disney of the old days. By old days, I mean everything up until 2000. Waking Sleeping Beauty is a great documentary on the era known today as the Disney Renaissance. This era of success for Disney animation took place during the mid 1980s to 1999. The studio had been unsuccessful for most of the 1970s and early 1980. It seemed as if there was no end in sight for the studio. However, through some new hirings and certain events, the Animation Department and the Walt Disney Company struck gold. This documentary does a wonderful job of showing the inner-workings of the company and the department. It shows the good and the bad times. The film tells a great story of the successes and failures of Disney and about the people who were responsible. If you love anything Disney, then this is a film for you. Surprisingly, this was a really great film. The film loaded with great performances by the entire cast: Nick Nolte, Tom Hardy Joel Edgerton, and Jennifer Morrison. I could easily say it was one of the most underrated films of the 2011. I think there is great writing in this film as well. When you can put two brothers in a fight against each other in the climax of the film and the moviegoer who is watching can't decide who they love more then the screenwriter has done a great job. It was one of the films I watched early on in my "400 Project" and it has still stuck with me. It is sad to say that it did not do too well at the box office and very few people have actually seen it. So, I suggest for you all to go see it. Rob Reiner is one of my favorite directors. For some reason I just love the stories he tells. He has made a wide variety of movies such as When Harry Met Sally..., This is Spinal Tap, and A Few Good Men. Stand by Me is a great film. It was based on a novella by Stephen King. Like most of King's works, the best film adaptations of them are usually non-horror stories (The Green Mile and The Shawshank Redemption). The film has some great performances by some young actors at the time. The two performances that stick out the most to me are the performances River Phoenix and Corey Feldman. Another great thing about this movie is the music. The soundtrack includes songs from greats like Buddy Holly and Jerry Lee Lewis. If you want a nostalgia trip to the 1950s, then this might be one of your best choices. And I mean come on, it is narrated by Richard Dreyfuss. I have seen all of the film adaptations of John Grisham's works. I think most of them are really good films. I think The Firm, A Time to Kill, and Runaway Jury are all entertaining. However, I believe that the best all-around film based on a Grisham work is The Rainmaker. Francis Ford Coppola crafts a wonderful story set in the city of Memphis. Now, not all of this film was filmed in Memphis, but it makes good use of the city. This and The Firm show that more movies should be done in Memphis. There are great performances in this film from Matt Damon to Claire Danes and from Danny DeVito to Mickey Rourke (who has a very small part). The story is interesting and the film is a great courtroom drama, even though it just focuses on a family suing an insurance company. It is a must-see in my opinion for anyone who is a fan of courtroom dramas. Remember the Titans is one of the best football movies of all time in my opinion. The final twenty-five minutes of the film I believe is one of the most exciting sports moments on film. I don't know why, but I just love this movie. This might be one of the first movies that I ever saw that was marketed as "Based on a True Story". I really do believe that this film influenced the craze of sports-related true events. Very few sports-related true stories came before it. Every so many years, you would get an Eight Men Out or a Hoosiers. After Remember the Titans, however, there is a film like this every year. Since the release of the film, there have been films like Secretariat, Coach Carter, Radio, Friday Night Lights, The Rookie, Glory Road, and a number of others. I think Remember the Titans might be one of the most influential sports movies to the mainstream modern audience. This is one of the few movies that tells a great story about television news. Unlike the satirical Network, Broadcast News makes the audience laugh because of the down-to-earth characters. They are real and the audience is able to relate to them. James L. Brooks puts together a great follow-up film after his award-winning film Terms of Endearment. There is some great chemistry between the three leads: Holly Hunter, Albert Brooks, and William Hurt. The film was nominated for seven Academy Awards, however, it failed to win one. It should won at least one in my opinion. In my opinion, Dudley Moore plays one of the funniest drunks of all time. Unlike Russell Brand's interpretation of the character, Moore shows the difference between when Arthur Bach is drunk and when he is sober. There is a big difference between the two. That, in turn, makes Moore's portrayal a lot funnier. The film is one of the best comedies of all time in my opinion. It was original. It received four Academy Award nominations and two wins (Best Supporting Actor and Best Original Song). The other nominations included Best Leading Actor for Dudley Moore and Best Original Screenplay. I think this a must-see if you love good comedy. This is not the original trailer for the film, but the original trailer was awful in my opinion. Here is a fan-made trailer that is a lot better in my opinion. 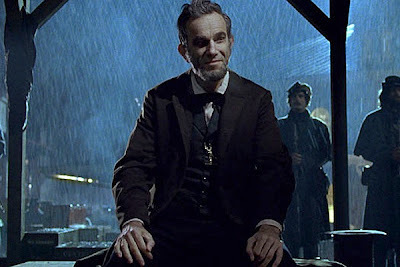 I remember how in September a lot of people in the film community were worried about Lincoln. There had not been a trailer released yet or anything. Then the reported reaction from the New York Film Festival was mixed, which is where it first premiered. The last time I saw a movie in theatres was when I saw Lincoln. Like everyone else in the film community, I was hoping it would be great. I mean Daniel Day-Lewis as Lincoln, Steven Spielberg as the director, and Tony Kushner as the screenwriter. That's a great trio in my opinion and they did not disappoint at all. I did not know that everything else in the film would be just as great. Day-Lewis gives a stellar performance as Abraham Lincoln, but the surprising performance comes from Tommy Lee Jones as Thaddeus Stevens. Everything about this film was great. The script, the acting, the production design, and the list just goes on and on. I can almost guarantee that Lincoln will have the most Oscar nominations this year. The only question I have at the moment is, how many Oscars will the film win? 90. O Brother, Where Art Thou? O Brother, Where Art Thou? is one of the best films depicting the American South during the Great Depression in my opinion. The film is a loose adaptation of Homer's The Odyssey. If you have read at least part of the epic poem then you will see the similarities...hopefully. Also, the film actually uses some real-life figures as characters, such as Tommy Johnson and George "Baby Face" Nelson. I love the story of this film. It is funny and dark. I think this is my favorite Coen Brothers film and the film definitely has the elements of a Coen Brothers film. The film is loaded with some great actors in Tim Blake Nelson, John Turturro, Holly Hunter, John Goodman, and George Clooney. The film also has a great soundtrack. I mean I actually own the soundtrack, but I don't own the movie for some reason. And that is saying something coming from me. Some of the standouts to me are "Man of Constant Sorrow", "Hard Time Killing Floor Blues", and "Po' Lazarus". If you like bluegrass, blues, or any old-timey music then the soundtrack is for you. The best thing about this film probably is the cinematography. I love it. Colors in this film are great. You will notice them just by watching the trailer. Well, that is part one of my Best of 400 list. There will probably be a total of ten parts in case you were wondering. I might put two or so together. You never know. But, tell me what you think of the movies. Have you seen any of these movies? Comment below. I want to hear about what people are watching.